During the Yucatán’s henequen boom, there were close to a thousand haciendas (plantations) in operation across the state. Today, they’re nearly all in ruins. 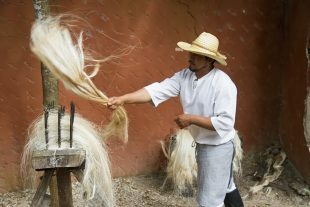 And in the area surrounding Mérida, only one still manufactures henequen: Sotuta de Peon. We joined a tour of the hacienda which led us through a mansion, the factory, a Maya house in the agave fields, a cenote, and ended at a restaurant serving up Yucatecan specialties. The road leading inland from Puerto Morelos has just one thing on its mind: cenotes. Sign after hand-painted sign exhorts you to visit Cenote Las Mojarras! 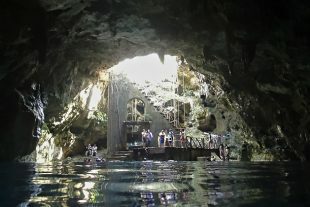 Cenote Boca del Puma! Cenote Verde Lucero! Without prior information, it’d be impossible to know which to choose, so we made sure to get a recommendation. 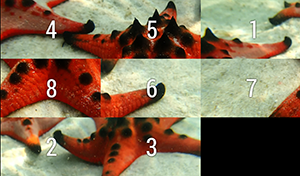 And those we talked to were in agreement that Cenote Siete Bocas, or the Seven-Mouth Cenote, would be unforgettable. Hundreds of cenotes pockmark the earth of the Yucatán Peninsula. Fed by subterranean rivers, these pools once served as sources of fresh water for the Maya, but today they’re primarily used for fun. 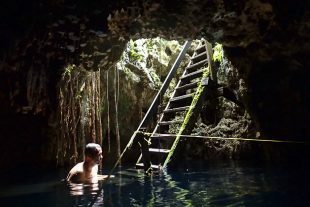 We visited three amazing cenotes on a popular tour leaving from the village of Chunkanán.